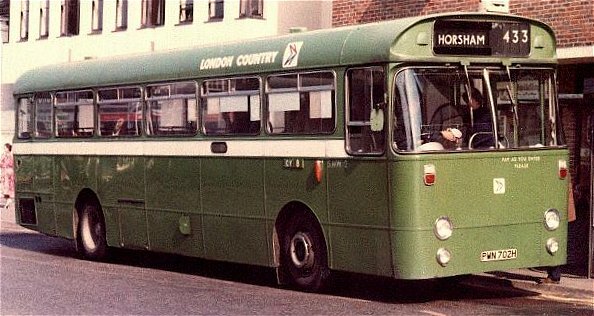 The Welsh Swifts were tangible evidence that London Country was now part of the National Bus Company. The new company was very aware that the age profile of its buses was way out of line with the NBC norm, with its large fleets of RTs, RMLs and RFs. Worse, the doubledeckers were crew operated. Its economic position, without GLC support and with the predominance of Conservative councils in its area meant that it very quickly had to convert to one man operation or die. It had some Merlins and Swifts, but these were not proving as reliable as London Country would have liked. It desperately needed new buses. With the British bus manufacturing industry also thrashing about downsizing itself the queue for new ones was paradoxically long. The National Bus Company came to the rescue. Three two-year old dual-door Swifts belonging to South Wales Transport were looking for a new home: London Country snapped them up. They were quickly followed by a dozen single-doorway Swifts that were just six months old. SMW1-3 were 48 seater 36ft Swifts (ie Merlin length) with Willowbrook bodies very different from that on the LT Merlins. 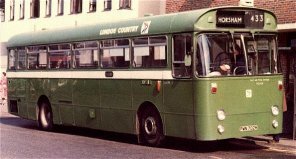 They wore Lincoln green with a canary yellow waistband, and sported aluminium trim stripes and AEC flying triangle badges on the front. Other unusual features included the roof sky-light near the front, and the illuminated one-man-operated indicator on the front.Also the windows on the two sides were not aligned, so that the roof joints did not coincide with offside window pillars. These three arrived in September 1971, and went to Crawley for use on local services 474, 475 and 479, all routes that had been taken over from Southdown in April 1971, and which used SM Swifts and RTs as required. The welsh Swifts stayed at Crawley, and were associated with these routes all their working lives, although they did get excursions on the 405 and 433 short workings too. SMW2 at least was painted eventually into NBC green with white waistband and coloured logo, and was seen on Godstone schools workings in later life. They were withdrawn in early 1981. SMW2 on the 433 (Crawley - Horsham) in NBC livery, and minus its go-faster aluminium trim, opo lamp, AEC badge and grille. Some overhaul staff - or accountants - have NO spirit of adventure. The first three were followed by a dozen younger buses from South Wales. These also had BET-style bodies, this time by Marshall, and with single doorways. They seated 53. There was a number of more subtle variations from the first batch, although they had a strong family resemblance. The window arrangement was different: fewer longer windows, arranged symmetrically. (They initially had non-opening windows, but were fitted quite soon with sliders). These buses lacked the forward skylight, but had an opener right at the back, and prominent ventilators on the sides of the roof. The trim was placed differently too, with a deeper yellow waist-band and the middle go-faster stripe placed lower. The omo indicator was now placed centrally on the front. A heavy chrome trim occupied the bumper position at front and rear. There was no front grille. The driver's windscreen wiper was moved towards the offside. His side window was larger. The 3-track number blind and destination blind were the other way round. The dozen Marshall Swifts were allocated to St Albans, where they remained throughout their working lives. Routes included the 338, 343, 358 and 361. They started straight away when the first five arrived in October 1971, replacing RTs that needed recertificating, and using crews, and took over the routes formally with one man operation in January 1972. At overhaul and repaint in 1976-7 they went into NBC green with a white waistband. Some lost the aluminium trim, others just had it overpainted. Most lasted until the end of the decade, but the remainder were withdrawn in April 1981.